Please choose from our range of jar sizes below or for more information about our Strawberry Vinegar, please Click Here. For trade enquiries and prices please Contact Us or visit our Trade Enquiries page. Ingredients: Strawberries, White Wine Vinegar and Sugar. Strawberry Vinegar contained in a 150ml glass blottle. 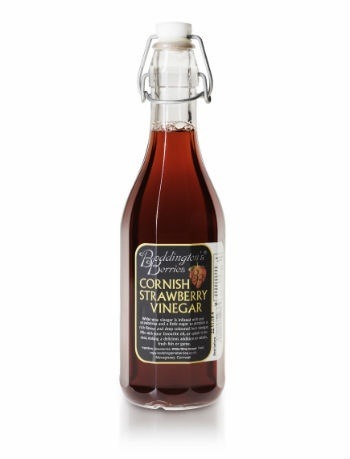 A fruit vinegar, this makes an exciting salad dressing, either on its own, or mixed with your favourite oil. It is also wonderful splashed on game. For the adventurous, you could try it on ice-cream or inside trifles. Used as a cordial it is said to be very good for colds. Retail box of 8 no. 150ml glass bottles of Strawberry Vinegar. Strawberry Vinegar contained in a 500ml glass bottle.